Along with sweet potatoes, beets, onions and radish, carrots are considered root vegetables. And believe it or not carrots, whose scientific name is Daucus carota, are in the same family as celery, dill, fennel, parsley, caraway and cumin. Reportedly, carrots are the second most popular vegetable next to potatoes. There are more than 100 species of carrots! You likely just eat orange carrots, but there are also purple, red, yellow, and white carrots which were grown long before the appearance of the sweet, crunchy and aromatic orange carrot that is now popular. And now at your local farmers market, you may be enticed to pick up a bushel of rainbow carrots. I love carrots, because they are one of those healthy, grab-and-go snacks I can always rely on. They are also a favorite treat for my four legged family. The crunchy texture and sweet taste is great for when I have a salt or sugar craving. And we all know that carrots make the perfect vehicle to eat guacamole and hummus. After doing some research on this common veggie, I discovered some very powerful health benefits of the carrot. Carrots may be relevant in the fight against diseases, like cancer. Carrots are rich in beta-carotene (one cup of raw, chopped carrots has 10605 mcg of beta-carotene). 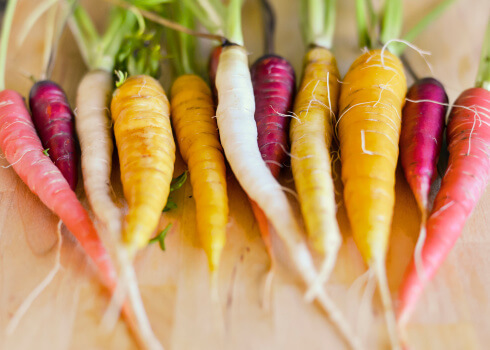 Beta-carotene is an antioxidant (which helps fight free radical damage that can lead to disease) and pigment found in plants that gives them their color. Your body converts beta-carotene into vitamin A. (High amounts of vitamin A can be toxic, but your body only converts as much vitamin A from beta-carotene as it needs). “Studies that look at big groups of people suggest that those who eat 4 or more daily servings of fruits and vegetables rich in beta-carotene may reduce their risk of developing heart disease or cancer,” reports the University of Maryland Medical (UM) Center. It is, however, extremely important to be careful when taking beta-carotene supplements particularly if you are a smoker or someone who as been exposed to asbestos. Every person is different (and, of course, always consult your doctor), but with a beta-carotene rich food like carrot readily available to us all I don’t see why anyone would need beta-carotene supplementation. Another study, supported by the National Institutes of Health, found that extracts from carrots may induce apoptosis (cell death) and cause cell cycle arrest in leukemia cell lines. “The findings suggest that carrots may be an excellent source of bioactive chemicals for the treatment of leukemia,” the study says. Carrots may help support eye health and vision. According to the National Institutes of Health (NIH), vitamin A deficiency is one of the top causes of preventable blindness in children. Carrots are an excellent source of vitamin A. Just one cup of raw, chopped carrots contains 1069 mcg of vitamin A. The recommended dietary allowance (RDA) of vitamin A for a child (male or female) between 4-8 years is 400 mcg. For a female adult between 19-50 years, the RDA is 700 mcg (more if pregnant or lactating) and for a male between the same age bracket it is 900 mcg. “Vitamin A is critical for vision as an essential component of rhodopsin, a protein that absorbs light in the retinal receptors, and because it supports the normal differentiation and functioning of the conjunctival membranes and cornea,” reports the National Institutes of Health (NIH). Vitamin A also plays a role in immune function, reproduction, cellular communication and maintaining healthy skin and mucous membranes. Carrots may lower glucose levels and cholesterol. Carrots are low-fat, cholesterol-free and a good source of soluble fiber. This type of fiber attracts water and turns to gel during digestion. It actually slows digestion (which is why you may want to avoid eating carrots before your bedtime. This can affect your sleep). If you have diabetes, eating soluble fiber may slow the absorption of sugar and improve your blood sugar levels. An added bonus is the vitamin A in carrots may help protect you from diabetic retinopathy, the most common cause of vision loss among people with diabetes. Carrots do contain a significant amount of sugar (about 6 grams in one cup of raw, chopped carrots), but the majority of reports say carrots in moderation are still a great food for diabetics. As always, consult your doctor. Soluble fiber may also lower your cholesterol. “Different foods lower cholesterol in various ways. Some (like carrots) deliver soluble fiber, which binds cholesterol and its precursors in the digestive system and drags them out of the body before they get into circulation,” according to Harvard Medical School. Having healthy cholesterol levels are key in helping prevent cardiovascular disease, but at the same token you do not want your cholesterol to be too high you also do not want it to be too low. Carrots may help you manage your weight. Craving something crunchy? Have some carrots. Craving something sweet? Have some carrots. Choosing healthy foods to alleviate our cravings is key in losing weight and maintaining a healthy weight. If you can make a habit of eating carrots instead of potato chips when you need a midday snack, eventually you may find that you don’t miss those chips! Still not convinced? Try making your own carrot chips. The water and fiber content in carrots may also help prevent hunger pangs you may have in between meals, making carrots the perfect snack. Have them with a little bit of guacamole or hummus. Carrots may help with the health of your teeth. As mentioned, carrots are a great source of vitamin A. This vitamin helps keep gums healthy and build tooth enamel. Snacking on raw carrots also increases saliva production. “Saliva contains important elements such as bicarbonate, calcium, and phosphate. They not only neutralize plaque acids, but also help repair early tooth damage and decay,” according to the American Dental Hygienists Association. Let’s take a look at some of the additional nutrients and health perks of carrots. Calcium, 42 mg. Of course, calcium is important for building and maintaining strong bones and teeth. This mineral is also important for maintaining hair and nail health in perimenopausal and menopausal women. Adequate calcium intake may also decrease your risk for colorectal cancer. Magnesium, 15 mg. This mineral is needed by more than 300 human body enzymes to facilitate biochemical reactions. It helps create energy for the body and activates muscle and nerve tissues by enabling potassium and calcium transfer through your cell membranes. If magnesium levels in the body are too low, whole body systems don’t work properly, resulting in fatigue and cramps. Phosphorus, 45 mg. This mineral works with calcium to help build strong bones and teeth. It is also needed to help balance and use other vitamins and minerals including vitamin D, iodine, magnesium and zinc. Sodium, 88 mg. Sodium is one of the most important minerals in the human body. It regulates your body’s fluid levels while keeping your brain sharp. Sodium also prevents your muscles from cramping and even defends your skin from free radicals that accelerate your aging process. Folate, 24 mcg. Most adults need about 400 mcg of folate daily. If you are pregnant, you may need more. Folate is essential for cell growth and many other bodily functions. To see how much folate you need, click here. Choline, 11.3 mg. Choline is a nutrient that was recognized as an essential nutrient by the Institute of Medicine (IOM) in 1998. “The importance of choline in the diet extends into adulthood and old age. In a study of healthy adult subjects deprived of dietary choline, 77% of the men and 80% of the postmenopausal women developed signs of subclinical organ dysfunction (fatty liver or muscle damage)," reports the National Institutes of Health (NIH). Ways to eat carrots other than just by the handful? People often just eat the taproot (the orange part of the carrot), but the greens (attached to the top) of the carrot are also very nutritious and are great tossed in salads or blended into a smoothie. If you can, eat carrots raw in order to preserve their nutritional value. If you have to cook them, just steam for 6-7 minutes. This method of cooking helps preserve their nutritional value and makes a nice, simple side dish. Other than carrot cake, you probably don’t think of carrots as being a baking ingredient. But check out these Healthy Carrot Cake Oatmeal Cookies. And why not make eating carrots fun for the kids? Check out this Catch the Carrot game. It is informative and may even help parents with mealtime stress. Are there any downsides to eating carrots? Carrots do contain a substantial amount of sugar. If you are prediabetic or diabetic, consult your doctor. Giving carrots to small children and infants also has its risks. Consult your pediatrician. Some reports say that carrots may change the flavor of breastfeeding women’s milk. So this is something to be mindful of if you are breastfeeding. And as always, if you have any existing medical conditions or are taking any medications (both prescription and over-the-counter), speak with a competent healthcare professional. You always want to avoid drug interactions. Finally, some people are not for eating the prepackaged baby carrots because reportedly they are washed in small amounts of chlorine. Others say it is not enough chlorine to do any damage. This is a personal choice, but I guess it doesn’t hurt to buy fresh carrots by the bushel at your local grocery store or farmers market.